Running a web design project is like any other project: in order to be profitable, you need to reduce the amount of time and rework while maintaining a high level of quality. This means your web design process needs to be streamlined. The process is the outline of the project’s steps from start to finish. These steps should be clear, concise, be easy to follow, and work with practically any web design project. Every website is different and has different needs and goals, but the process of designing them is basically the same. 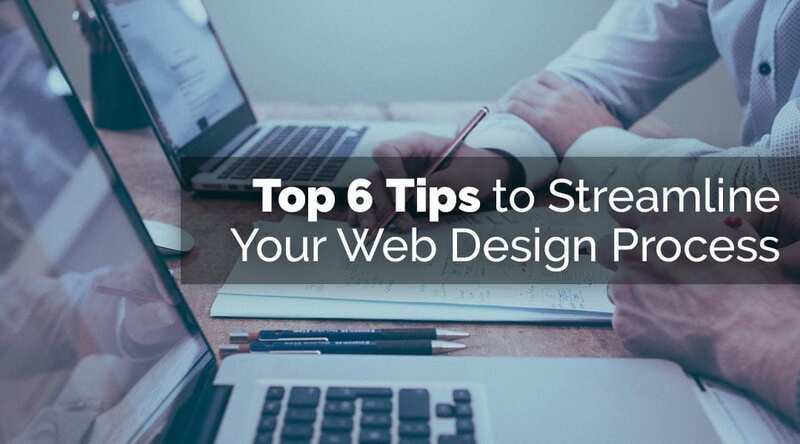 In this article, we’ll discuss the top 6 tips to streamline your web design process. The tips follow a logical development sequence, which can be used as an outline or checklist for your web design project. Break the project into clear phases. This creates a structure that you can follow, breaking the project down into smaller steps, and allows you to create a checklist for each step. Follow the same steps with every project and streamline them as you go to continuously improve your process. Each of these steps would include a list of items within them. Creating this type of list ensures nothing is left out and that each step is done in order so you’re focusing on the right thing at the right time. The planning phase breaks the project into smaller components, determines what has to be done, and when it has to be done. Use project management software to track each of the project’s steps. This can be something like Google Sheets, Microsoft Project, or any other PM tool you’re familiar with. It needs a way to set dates, mark items as complete, add notes, etc. Develop good communication practices and establish the best way to communicate with the client. Be sure they understand the level of communication you’ll need and what will happen if you have to wait for information. Have clear responsibilities. Make sure the client understands what you are responsible for and what they’re responsible for. This will help keep the client from disappearing until the end of the project when you needed information or materials from them. Ask detailed questions before developing the project plan. This reduces the amount of email or communication needed so you’re not waiting on answers. Analyze the requirements to understand the site’s direction and purpose for the end users. Create an information architecture using tools such as wireframe diagrams to show the structure of pages, user interaction, navigation, and content. Determine the software requirements. This includes hosting, backups, security, content, graphics, fonts, etc. Review throughout the project to ensure you’re on the right track. Keep the information simple and easy to read. In the design phase, all of the planning is completed and the resources are gathered. Use the best tool for the job. Don’t waste time trying to make a tool work when it doesn’t have the features you need. This might mean paying extra for the exact tool you need, but the time you save will pay for itself. Use tools such as Canva, Niice, or similar to create mood boards to help your client decide on fonts, colors, branding, etc. Use tools such as Divi to help in the layout design process. Divi mockups can be faster than building wireframes and mockups using complicated design apps, and you’re building the layout at the same time. When wireframing, even if you’re using something like Divi, don’t get bogged down with design elements. Ignore those elements until later. Use free photos from sources such as Elegant Themes, Unsplash.com (using plugins such as Instant Images to upload the images to your media library instantly), or Placeholder.com to create placeholder images to demonstrate the layout. Create several mockup posts and pages with content that can be used with any layout. Import these posts and pages into each website so you don’t have to start from scratch every time. This will help the client to see a finished product rather than just seeing a skeleton and imagining the rest. Focus on usability before aesthetics. Use premade layouts where possible and make your changes to get a quick start in the design rather than starting from scratch. Have the client approve the final design before moving on to the development phase. Don’t start the development phase if the client isn’t sure what they need. The development phase breaks down the design elements and so you can start coding and customizing the design. Build the site structure, create the page layouts, navigation, header, footer, sidebars, and import and publish the content. Rather than coding the layout in the WordPress theme by hand, use a tool such as Divi to help speed up the development process. When working with a theme like Divi, add the CSS to a central location, such as within a child theme or the theme options. This will keep you from having to open each module or page to make your customizations. Use a common list of plugins that you’re familiar with. You can even import settings in many plugins. Test every page, image, and button for usability. Have the client inspect and approve the website’s final design. If you’ve kept good communication with the client the website should look and work exactly as they expect it to. In the launch phase, you’ll transfer the website from the development, or staging, site to its live location. Follow back through the checklist to ensure that everything has transferred over and that everything is working as it did on the development site. Test the site on multiple devices and with multiple browsers to ensure that it’s responsive and everything works as expected. The post launch phase covers ongoing care and maintenance. Train the user’s on how to use the website. This includes creating content and making updates. Handoff all documentation to the client including any design documents, product keys, warranty information, etc. Follow up with the client to identify any additional needs such as ongoing maintenance, customizations, additions, or modifications. Streamlining the process from beginning to end will save you time and money, and help you to produce a better product for the client on the first try. Your projects will run smoother, you’ll have less re-work, and you’ll gain time. This will help you meet tighter deadlines, take on more work, improve your bottom line, and help you attract higher quality clients. The best way to streamline is to create and follow a checklist. The tips in this article were designed to provide you with information to create that checklist. Do you have tips to streamline your web design process? Let us know about them in the comments. Now I am seeing that more and more designers are now opting for atomic design structure as it provides them with an organized way to manage their work and success. Most of the organizations put emphasis on providing them more measurable success in every work so it becomes really difficult for people who do creative work to show their success so approaches such as atomic design has helped designers greatly in managing their work but vice versa I believe such approaches also decline creativity. Nowadays, web designing is in-demand. Anyone with knowledge of web designing can create a design for a website. But, having knowledge alone is not enough to create a good and responsive web design. It is important to know the basics of a good web design. Thank you for sharing this information! Nice article Randy i noticed you mentioned the planning phase in detail and i couldn’t agree more, people usually don’t spend much time in the planning phase and jump into the designing making it difficult for the designers and them selves as well. This also ends up in additional time consumption.